Streamyx, being Malaysia’s premier broadband provider serves a big portion of our country’s Internet users. I myself have been using it as soon as it was made available in my area many years ago. Along the way, I have tried out a few other broadband providers but still find that Streamyx provides me with the best overall package in terms of pricing, usage and availability. Every individual has their own need and requirements on broadband usage. Depending on those variables, a certain broadband service provider and its packages may be more suitable compared to the others. High speed — at up to 4.0Mbps, your media streams smoothly and your photos load at their shutter speeds. Makes dial-up seem like a bad dream. No disconnections — data flow that’s constant and consistent ensures no more time-outs and no more restarting downloads. Great value — pay one fixed rate per month, and waste no more time waiting! However, every now and then, many (myself included) experience sluggish Internet connection speed that is well below what our respective packages offer. Some might even be battling with this problem on a daily basis. However, I have been told that many a time, the causes of our sluggish Internet connection lies in our own CPE. Do see below on some basic guides on how to have a better online experience. When you are getting the Error 691 (Invalid login ID or password) message, you have probably entered the wrong login ID and password combination. Also take note that the login ID’s format is loginID@streamyx, without the “.com” at the end of it. The login ID is also case-sensitive. When you are getting the Error 678 (Remote computer did not respond) message, your modem, network card or splitter may be faulty causing the lost of connection. You will need to look closely at your LED lights on your modem to troubleshoot this one. When you are getting the Error 769 (The specified destination is not reachable) message, you may have a disconnected network cable, faulty network card or corrupted network driver. If the Link/DSL light is blinking, switch off your modem and restart it after 30 to 60 seconds. This is quite common and has been documented in one of my previous posts. Make sure the telephone cable is connected properly to the modem. Try using another RJ11 telephone cable or bypass the splitter if restarting the modem fails to solve the problem. If the LAN/ETH light is off, ensure that your RJ45 network cable is properly fitted into the back of your PC and modem. Retry with a different working cable to check if your current one is faulty. If that fails, try reinstalling your network card driver or updating it to the latest copy. Another common problem that people experience is that Streamyx stopped working suddenly. Firstly, check with the people around your area to identify if the problem is affecting a large area or only you. If it is the latter, then there are a few things you can do before calling TM for assistance. 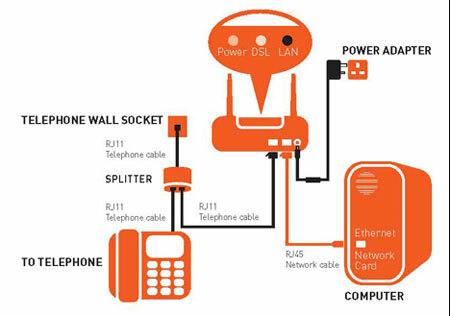 The diagram above shows a typical setup every Streamyx user should have in their home or office. In order for your Streamyx connection to function properly, every component and cable involved must be in working condition and fitted correctly. Firstly, check and make sure your phone line that is connected to the modem has a dial tone. Make sure all cables are properly connected. Then, ensure your cables are in working condition by testing it with cables that you know do work. You can also remove the splitter and phone so that the telephone cable is connected to the modem directly from the wall socket. You should also check your phone bill to make sure that you have no outstanding bill and that your account is not suspended. If all efforts fail, then proceed to contact TM’s support by dialling 100 on your landline. 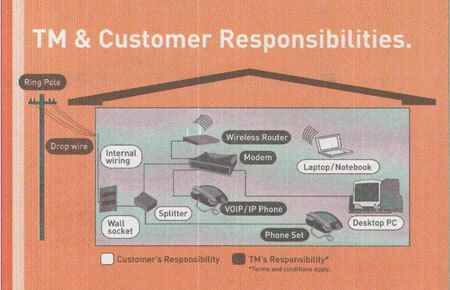 The diagram below shows a different perspective of components that are divided into two categories — those under TM and customer responsibility. In order for you to experience optimal broadband speed from Streamyx, you need to ensure that Customer Premises Equipment (CPE) under your responsibility must be in working condition and compatible with TM Internet system. You also need to ensure that your PC and ADSL router has been configured correctly. Any faulty CPE in the setup can affect the speed and availability of your broadband service. You can get detailed information on these guides on the Streamyx website. If possible, we should try these troubleshooting steps before contacting TM’s support. There was once when the support team arrived at my home only to realize that the telephone cable was unplugged the previous night due to lightning. Once you have exhausted all possible option, dial 100 on your TM line and follow the instructions to get help from TM’s customer service. 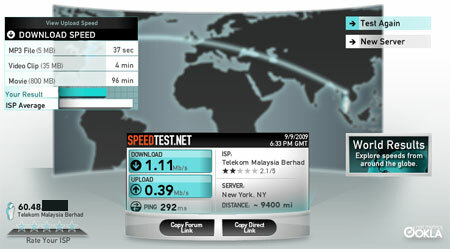 The screenshot above taken from a speed test conducted on my PC at my rented room in PJ. I am able to download files at a maximum speed of 160kbps. Just giving credit where credit is due. I read about theTM’s New High Speed Broadband Service. I think the price for the 5mbps is affordable but I don’t like the cap on downloads. Hopefully in future TM will offer unlimited downloads for the same price. The important thing is that TM improves its service as currently Streamyx is always lagging. Thank you for interesting tips about streamyx problem. 3 day ago i just get my internet (4 mb). but when i test the speed not even reach 2 mb. does this normal or else? wht i need to do if my stramyx modem spoil already ? ?